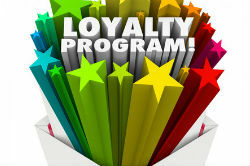 Welcome to our customer Loyalty Program! For every online order over $10.00 you will receive 1 point. Once you accumulate 10 points, you will receive a reward in the amount of $15.00 towards any online order. Redeem the coupon at any time by clicking Enter Coupon button at checkout. When you register AFTER your first order - you will automatically be enrolled and start earning points.